Tough economic times call for drastic measures. With unemployment rates reaching an all-time high, job security is a concern for even the most seasoned worker. Rather than face an untimely layoff, why not join millions of savvy entrepreneurs and start a business of your own? For little to no start-up costs, you, too, can be your own boss and have the option of working in your pajamas! Here's how someone with no capital can create their own schedule and run a successful business venture in their living room. 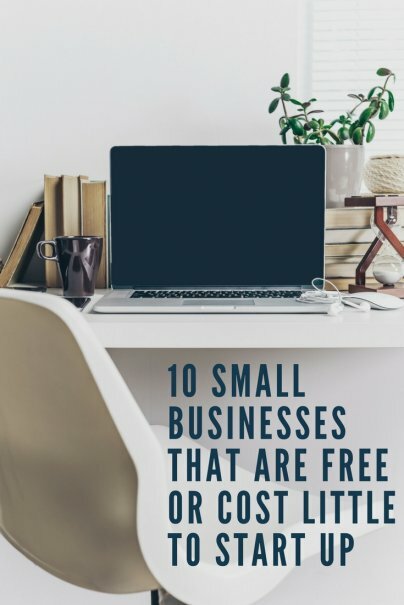 Here are 10 businesses you can start with little to no money today. Websites like Textbroker, Demand Studios, Quality Gal, Mahalo, and EduBook pay a nominal fee for the articles that you write. Free to join, you can earn anywhere from $1 to $15 for the content that you produce for these sites. Working as an independent contractor, it is your responsibility to complete and submit a W9 form for each business that you write for. If you are really ambitious and feel like you can command a higher wage, check out Craigslist, Indeed.com, and Ed2010 for better paying gigs. Advice to Live By: "Keep a copy of all of your published articles in a digital portfolio that you can email to potential clients." Share your love for taking pictures by making them available to a larger market. A number of websites pay for stock photography. A few of the most popular include BigStockPhoto, Fotolia, iStockPhoto, and ShutterStock. For those of you who want to make more money off your photography, check out ConstantContent and set your own prices. Advice to Live By: "Make sure to watermark your photos before posting them online to share with friends and family members. Dishonest people will use your photography without permission if you don't take the time to do this simple act right away." If you create web pages or know a thing or two about graphic design, you will find more work than you can handle on the internet. Individuals and corporations need designers like you to drive business to their websites. Put your skills to use and start looking for gigs on GetaFreelancer, Upwork, and ScriptLance. Advice to Live By: "Do not cheapen the quality of your services by bidding too low on a project. Ask a fair price and forget about the gigs that are not willing to pay you what you're worth." Websites like ETSY, Artbreak, and BoundlessGallery provide creative types with an outlet to sell their handmade stationery, bedazzled clothing, and altered art. Frequenting craft fairs and art shows can also give you an advantage over your competitors. Eventlister is a service that lists upcoming events in your area. Registration is required to access full listings on the site but only takes a few minutes to complete and there are numerous ways to earn free membership by referring friends, updating listings, and sending in applications for events. Advice to Live By: "In addition to the cost of materials, add in labor to the price of your artwork and handmade wares." Are you good at Math? A born leader with a knack for instructing others? If you possess a certain level of expertise in a subject, by all means, share it with struggling students! Parents and college kids will pay good money for a patient, dedicated tutor. A number of websites help match candidates with paid work. A few of the more reputable ones are WyzAnt, Kaplan, eSylvan, GrowingStars, and Brainfuse. Advice to Live By: "The more websites you sign up for, the greater your chances of tutoring full-time. If paying a percentage of your wages to a third party doesn't appeal to you, print out business cards and rely on word-of-mouth advertising to launch your business." The Caretaker Gazette is a valuable resource to have on hand for anyone interested in housesitting. Containing information and caretaker listings in the 50 states as well as Canada and Mexico, the bi-monthly publication costs $29.95. In addition to taking care of properties nationwide, people can use SitterCity or Care.com which are free services that matches up babysitters, elderly companions, and pet sitters with clients in a number of locations. Advice to Live By: "Do not give out contact information to a person until after you have done some research on them. A criminal background check on a client is a small price to pay in terms of your safety." Do you love to shop and have a keen eye for detail? Companies from around the world are looking for people just like you to evaluate the level of customer service that you receive when visiting their stores or places of business. An easy way to make money, mystery shopping offers more than just a steady paycheck. Some companies have been known to foot the bill at extravagant restaurants and on luxury cruises. Others will pay top dollar for you to test drive a car or reimburse you for the purchases that you make. Sign up today with Jancyn, Strategic Reflections, Shoppers Inc, and Corporate Research International. Advice to Live By: "Do not expect to get rich by secret shopping one location. The key to success is to register with multiple shopping companies and to check your email frequently." UniversalClass, Craft Ed Online, and TeachStreet are a few of the places where your knowledge can be put to the test. All three websites are looking for teachers from all backgrounds to instruct students on a variety of subjects. From personalized guitar lessons to test preparation and bellydancing, men and women can build their businesses by setting up a profile and registering as a teacher on these sites. Advice to Live By: "Avoid paying astronomical fees to list your services on websites. Opt instead to choose places that allow you to post ads for free." Type away while sitting in the comfort of your home office. Companies like Capital Typing and Virtual Office Temps make it easier for you to find legitimate work-from-home opportunities. Searching sites like CareerBuilder and Indeed on a regular basis will also help you locate individuals and corporations needing your assistance. Advice to Live By: "Set up shop in a quiet part of your home that is free from noise and distractions. Invest in a good headset and pick a home phone plan with unlimited long distance calls." Remember those people you see handing out samples at the supermarket? Why not become one of them? The pay is good and your only expense is a folding card table that you can be taken with you to other gigs. Southern Exposure Marketing and Studio 1 Casting Service provide opportunities to demo at tradeshows, mass merchant retailers, and supermarkets. Advice to Live By: "Wear a comfortable pair of shoes because you will be standing on your feet the whole time that you are working." Before you travel down the road to sole proprietorship or independent contracting, you may want to do some research. Being well-informed can prevent stress and keep your business running strong for years. In fact, it is important to do the following things before putting any time, money, or energy into an endeavor. What are you good at? Do people tell you that you make a mean apple pie or compliment your handmade jewelry? Have you been paid to write cover letters and resumes for friends? Are you the first person to receive a call when a family member's car breaks down? Although insignificant to you, these types of skills have the potential of making you big bucks. 2. Look for a niche or untapped market. If you have a great idea and no one else in town is doing it, by all means, develop your idea. The first doggie bakery in your city can prove to be more than just a novelty. This is especially true in small towns where traveling to another city to purchase hard-to-find goods can be stressful. Before putting your blood, sweat, and tears into a business, learn more about your competition. Who else offers personal training sessions with a twist? How much do they charge and who does their advertising? Where are they located at? Did you get a good first impression upon meeting them or calling them on the phone? The more you know, the better the chance your business will grow. Don't wait for customers to come to you. Find a way to network and get your name out there. A significant amount of time freelancing is spent finding new clients. Send an email introducing yourself and highlight the services that you provide. Include a way for people to get into contact with you and a sampling of your rates. Cut out the middle man by doing as much of the grunt work as humanly possible yourself. Low overhead costs mean more profit for your business. 6. Make Social Media work for you. Digg, Tweet, and post on Facebook and MySpace regularly. Talk up your business as much as possible. Create a blog or website and refer people to it. Ask them to pass on the news, as well. Set a price according to your expertise, the money that you need to survive each month, and the competition. Raise and lower your prices as times change. Don't be afraid to ask for more money as customer demands grow in size or number. Through trial and error, you can build a small business from scratch simply by taking advantage of the resources that are made available to you. From peddling your handmade wares to building a client base of students to teach and tutor, there is money to be made by getting online. It stands to mention that you should never pay some company to get you started in any of these. There are too many scams around that seek to make you pay to be involved in any one of these types of businesses. I think that this should have been mentioned first and foremost! First of all, expensive equippment is needed...cameras, lights and lenses. A point-and-shoot or even a basic SLR is not going to cut it. Secondly, stock photography agencies only pay pennies per image to the photographers. Very, very true! You have to practically be a professional. What a great article. Thank you for taking the time to write it. I especially appreciate the information about freelance writing. I landed my first real freelance writing position about a month ago. I'm really excited about it and having fun! My client's product is a pre-paid debit card by MasterCard called Mango Money, and I'm using it in my daily life to budget my money. I feel so fortunate to use a product that helps me budget my money while getting income. What I love about writing is the opportunity to express my thoughts. This is really the first time in my career where I've been able to be so creative. If anyone else in the forum has suggestions on outlets for freelance writing opportunities, I welcome the ideas! @dan Agreed on the stock photography. Not worth it. I used to be a photographer and have a number of very good images with stock agencies for a while and didn't get anything from them. Dollar stock (istock) has killed hte market. It's great for bloggers though to buy images! :) Freelance gigs, seniors, or weddings is where the money is if you already have the camera gear and skills. Lawn moving was always my favorite growing up. Adults can do it to and make a pretty penny. Lawn moving was always my favorite growing up. That's something adults can do too. @Dan Also, I have to agree on stock photography as a no-go. I used to be a photographer and had some good work with an agency, didn't make a dime. However, I did make good money with seniors, weddings, freelance, etc. That's where the money is. That is, if you have the equipment and skills already. B/c the equipment isn't cheap. Great post and lots of great ideas. One other to add to the mix is affiliate marketing if you have a sales and marketing bent. These opportunities are about representing someone elses products or services and they also require no set up costs and are free to start. I'm not suggesting that you necessarily become an affiliate of One Sherpa but seeing an example can often help people grasp the opportunity. Please note: Best to be an affiliate in something you're naturally passionate about becasue its a representation business. I wouldn't recommend crafting if you actually want to make money. If you price your items to include labor (both the labor of producing and sitting at a booth and selling it) nobody will buy it. I agree. If after spending the money on materials, and the time on producing the items, you are lucky to cover costs of selling items you craft. Unfortunately, people are going to instead buy the mass produced items produced out of country for per piece cost of 35 cents including labor, marked up to 5 dollars, which is what they buy it at, which underbids you by 5 dollars. I'm not sure that this article was researched properly before written. Who was the fact checker? Great article! We at Insula Research also look to hire mystery shoppers and auditors throughout the US and Canada. I also know a few friends who also do some freelance writing. I'm going to send them your article right away. I disagree with the stock photography comment. Some people feel like you have to go to school and obtain a fancy degree to freelance write and I know for a fact that isn't so. I have a book deal and have no formal training and no degree. Isn't that something? Talent prevails! @Andee - Agree with you affiliate marketing is a good but difficult way to go. Good top 10 list tho. Will share with my friend who's looking to get into making dosh from online. Please have a look at http://graduatetutor.com/.